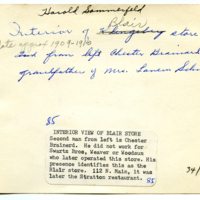 Interior of [Klingeberg -strikethrough] Blair Store. ^date approximately 1909-1910. 2nd from left Chester Brainard grandfather of Mrs. Lavern Schneider -- handwritten on back of photograph. 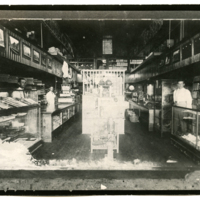 unknown, “Interior view of Blair Store,” Hesston Public Library, accessed April 19, 2019, https://hesston.digitalsckls.info/item/1371.